When you first buy a fashion clothing from the item-mall, you will have no way of knowing what the fashion stain color will be. Previously if you dont like the color, you will resort to buy-and-sell meaning buying the fashion with the color that you want and selling your fashion with the color that you dont want. Now dyes have been implemented in the game. 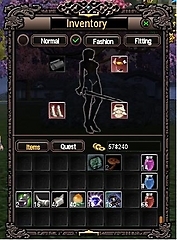 With 1 Dyestuff Package worth 200 gold from the item-mall, there is a chance of obtaining a "Random Dyestuff" or a specific Color Dyer, which can be any one of 32 colors. Dyes make changing the colors simple… but like everything else in this game, it comes with a certain price. When you see someone sporting a certain fashion and you think you will look good wearing it, why not try it for yourself? 1. 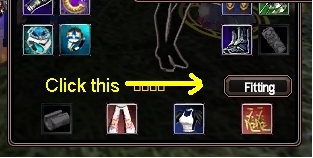 Right click the person and select "Player Information"
5. 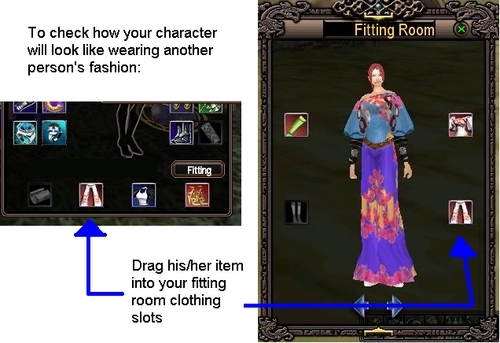 Then drag that person's fashion icon into your fitting room clothing slots to check how that certain fashion will look with your character. Now you have selected your clothing but you don't want the color. Simple, change it. Talk to the weaver and request to dye your clothing. 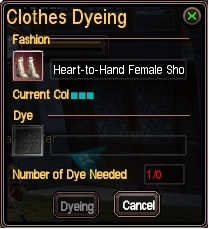 A screen will pop up and it will require you to put the fashion clothing you want to dye and the number of dyes required to complete the process. 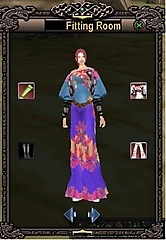 For each clothing, you will need certain number of dyes. 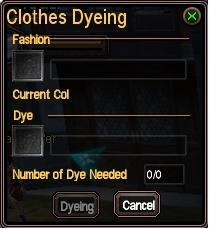 This list shows you how many dyes will be needed to change the color of your fashion.